A move by a group of hardline conservatives in the Republican-controlled U.S. House of Representatives promises to complicate Thursday's vote to pick a successor to outgoing Speaker John Boehner. The so-called House Freedom Caucus voted Wednesday to support Florida Representative Daniel Webster for the post, rejecting a bid by California's Kevin McCarthy, the House majority leader and Boehner's second-in-command, who has gained the support of the majority of the 247-member Republican caucus. 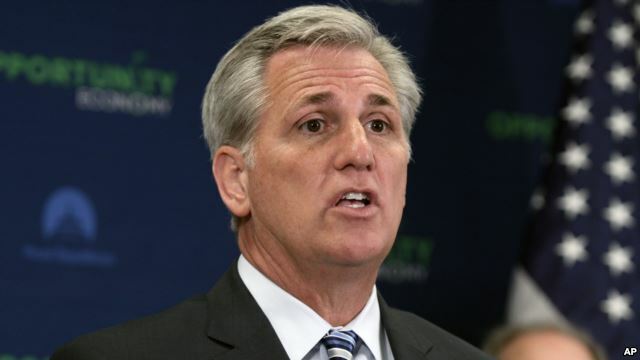 If the entire 40-member Freedom Caucus votes for Webster when the full House votes on October 29, shortly before Boehner leaves Congress, it will deny McCarthy the votes he needs to become speaker. Boehner announced his resignation last month after a 25-year career in the House, the last five years as speaker. His authority was constantly challenged by hardline conservatives -- many of whom were elected in the 2010 "Tea Party" wave that gave Republicans a majority in the House -- and who demanded a greater say in decision making and policy matters. Boehner decided to resign after agreeing to a short-term plan that kept the government fully funded past September 30, when its spending authority was scheduled to expire, in the process rejecting demands to strip federal funding for the women's reproductive health group Planned Parenthood from the budget. The effort to defund Planned Parenthood was strongly opposed by congressional Democrats and President Barack Obama, which set the stage for a possible government shutdown on October first. Under the U.S. Constitution, the speaker of the House follows the vice president in the line of succession to the presidency. 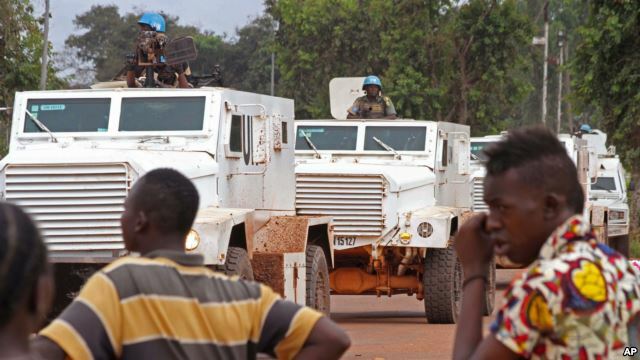 The United Nations has reported that one peacekeeper in the Central African Republic has been killed and another injured by armed attackers north of the capital, Bangui. A U.N. spokesman said Wednesday a convoy traveling between the towns of Damara and Ngerengou was fired on by unidentified gunmen, Tuesday, about 55 kilometers north of the capital. The spokesman said the peacekeeping force returned fire. U.N. Secretary General Ban Ki-moon has condemned the attack. He urged the attackers to lay down their weapons, and called for swift action to bring the attackers to justice. On September 28, the Central African Republic's interim leader, Catherine Samba-Panza, returned home early from the U.N. General Assembly because of reports that dozens of people were killed during three days of clashes involving Christians and Muslims, sparked by the death of a Muslim man. At least three people died when protestors gathered in downtown Bangui to march on the presidential palace. 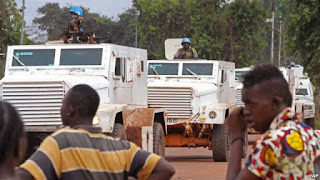 Protestors blamed U.N. peacekeepers for shooting into the crowd, but the U.N. peacekeeping force, MINUSCA, denied that its troops opened fire on protestors. Central African Republic erupted in violence in 2013 when Muslim rebels seized Bangui, leading to often brutal attacks and reprisals between rival Christian and Muslim militias. The country has been led by a transitional government since last year. Elections are scheduled for October 18, but are widely expected to be postponed. 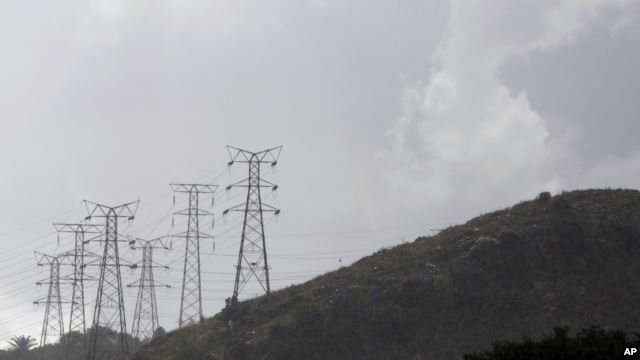 The African Development Bank said Africa’s power supply has worsened into a crisis. The bank said only one African in five has access to electricity, and that if the trend continues, fewer than 40 percent of African countries will reach universal access to electricity by 2050. In 1999, the West African Power Pool was created to provide electricity to the sub-region at competitive and affordable prices. In 2012, four members of the power pool - Ivory Coast, Liberia, Sierra Leone and Guinea (CLSG) - signed a treaty establishing a special purpose company called TRANSCO CLSG to develop and bring low-cost electricity to the four West African countries. Mohammed Sheriff, general manager of TRANSCO CLSG, said the project is expected to become operational in early 2017 with Ivory Coast providing 83 megawatts initially. “This project will become a reality beginning in early 2017. Currently we are in our procurement process. Hopefully beginning May 2016 we will start awarding contracts to contractors. We are evaluating the prequalification of potential contractors. That process will be concluded hopefully by December to January,” Sheriff said. He said the project is financed by the World Bank, the African Development Bank, the German government-owned development bank KfW and the European Investment Bank. The proposed 1,349 kilometer system will start from Man in Ivory Coast. In Liberia it will reach Yekepa in Nimba County, Buchanan in Grand Bassa County and the capital, Monrovia. It will flow to Mano, Kenema, Bikongor, Bumbuna, Yiben, Kamakwie and Kassa “B” in Sierra Leone, and Linsan and Nzerekore in Guinea. “We are not going to conclude the entire 1,349 kilometers before we can energize the lines. As we construct and finish a given lot, we will energize and make electricity available to the inhabitants of that area,” Sheriff said. Sheriff said the institutional structure of the company is headed by a Board of Directors comprising the heads of the utilities in the four countries. It also has a steering committee consisting of the four ministers of energy of Liberia, Ivory Coast, Guinea, and Sierra Leone. TRANSCO CLSG does not produce electricity, said Sheriff. Rather, it only identifies sources of cheap electricity and transmits it to customers. “What we do, we identify cheap electricity and transmit to those that are in need. On the aspects of the cost, we believe that once we conclude this line, the electricity that will be transmitted will be far cheaper. Our projection is basically saying that it will be 50 to 60 percent cheaper,” he said. He said Ivory Coast, which said it has excess electricity, has promised to supply 83 megawatts initially. This will come from the mix of hydro generation as well as gas turbines. U.S. President Barack Obama’s $7 billion Power Africa program plans to expand electricity across Africa. Sheriff said the West Africa Power Pool project is not part of President Obama’s Power Africa initiative. The Trans-Pacific Partnership, the most expansive trade agreement in history, is being hailed among its dozen member governments for unifying a market encompassing 40 percent of the global economy with $30 trillion total output. But the pact's implementation is not yet assured. After the secrecy during the negotiating process, politicians, special interest groups and the public in the 12 TPP countries will soon get to analyze the details when the entire document is published. Some are going to see items they do not like. And that will increase the pressure on legislators weighing whether to support it. If all of the participating countries do not ratify it within two years then six original signatories which account for 85 percent of the bloc's gross domestic product must ratify it. The math means approval by the United States is essential along with either Canada or Japan. Already there is considerable opposition expressed by some powerful U.S. senators, including those in President Barack Obama’s Democratic Party. Former secretary of state and now Democratic presidential candidate Hillary Clinton is among those opposing the TPP. The president, before signing the pact, has to wait at least 90 days after officially informing Congress of the agreement -- some expect that to occur within days. During that window the full text must be public for at least 60 days. A Congressional vote might not occur until sometime next year amid the distractions of the 2016 presidential election campaigning. “I could imagine that if the U.S. cannot or will not or is unable to implement the agreement that the others might decide to move ahead anyway and basically do a new version of this agreement without the United States,” predicts Deborah Elms, a TPP proponent who is the executive director of the Singapore-based Asia Trade Center. The TPP's fate in Canada could hinge on the outcome of federal elections on October 19. 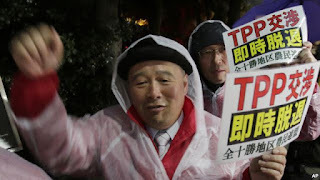 There is also significant opposition to the TPP in Australia and New Zealand, although it is likely to gain legislative approval in both countries, according to Asia Trade Center's Elms. “They believe that the Americans got far more of what they wanted than Australia or New Zealand got,” Elms, in Kuala Lumpur, told VOA. New Zealand’s Labor Party — currently not part of the government — is also upset with a TPP provision prohibiting foreign investment in land and housing. And Chile is another country where there could be strong congressional opposition, due to concerns about affordable access to medicines. Eventual ratification is seen as all but assured in Japan. 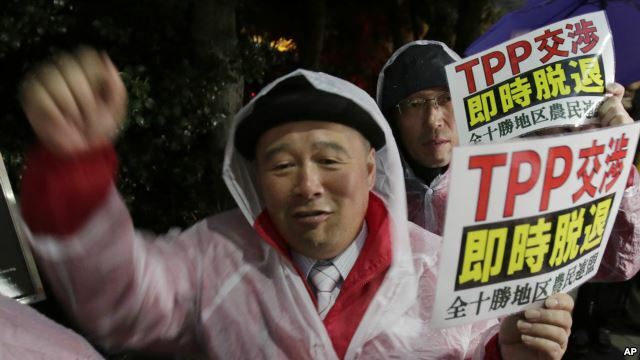 It will be examined by both houses of Japan’s parliament, and the government is considering holding an extra session through early next year, although it is uncertain if deliberation on the TPP will be finished. Significant moves by Japan on the agriculture front will have some farmers’ groups fighting approval. In Malaysia, opposition lawmaker Charles Santiago has criticized the TPP as “one of the most dangerous trade pacts when it comes to access to affordable medicine, particularly in the developing world.” He told VOA that Malaysia’s government has promised to follow the lead of the parliament's consensus. But it has the power to approve the pact even if the majority of lawmakers oppose it. “They could, because technically the constitution allows the cabinet to sign on to any trade agreement, which they have done all this while. But because of the pressure from civil society, from trade unions, from professional groups including small and medium industries, I think the government said 'look, we need a buy-in. And if parliament doesn't support the idea of this agreement, then we will not support it,'” Santiago said. Vietnam stands to be one of the biggest beneficiaries from the Pacific accord. The country's economy, by 2025, will be 11 per cent bigger than without the trade deal, with exports under TPP forecast to increase 28 per cent, according to a recent report by the Eurasia Group. “Vietnam has been fully prepared for TPP," according to Dinh Xuan Thao, chairman of the legislature's research institute. "As it decided to join the free trade agreement, it accepted to face short-term difficulties for greater benefits in the long run. The government has informed us about that during the negotiation process. We are united in that regard. Therefore, there should be no hurdles in approving it." But Thao told VOA there is concern in Vietnam about the rights of state-sanctioned labor unions in the communist country. A former prominent Vietnamese lawmaker, Nguyen Minh Thuyet, sees the TPP deal allowing Vietnam to have less reliance on its giant northern neighbor and its primary adversary over the centuries. “Vietnam’s current trade balance is tilted toward China, and major infrastructure contractors in Vietnam are Chinese, so Vietnam relies on China greatly," Thuyet said in a VOA interview. "Joining TPP, Vietnam would have more partners, and that partnership could help Vietnam to reduce its dependence on China in economic terms. It is also a desire of most Vietnamese; but, that requires determination and sound economic policies." Australia, Brunei, Mexico, Peru and Singapore are also TPP members. In those countries — where lawmakers and governments are generally seen as favoring global trade — the partnership is eventually expected to be ratified. A subsequent round is expected to see others lining up for entry. Most notably, China, the world's second-largest economy, is expressing interest. Thailand is another possible second round entrant, but more likely are Colombia, Costa Rica, Hong Kong, Panama, the Philippines, South Korea and Taiwan.